Bananagrams is a fun, quick paced crossword building game that can be enjoyed by both children aged 7+ and adults. 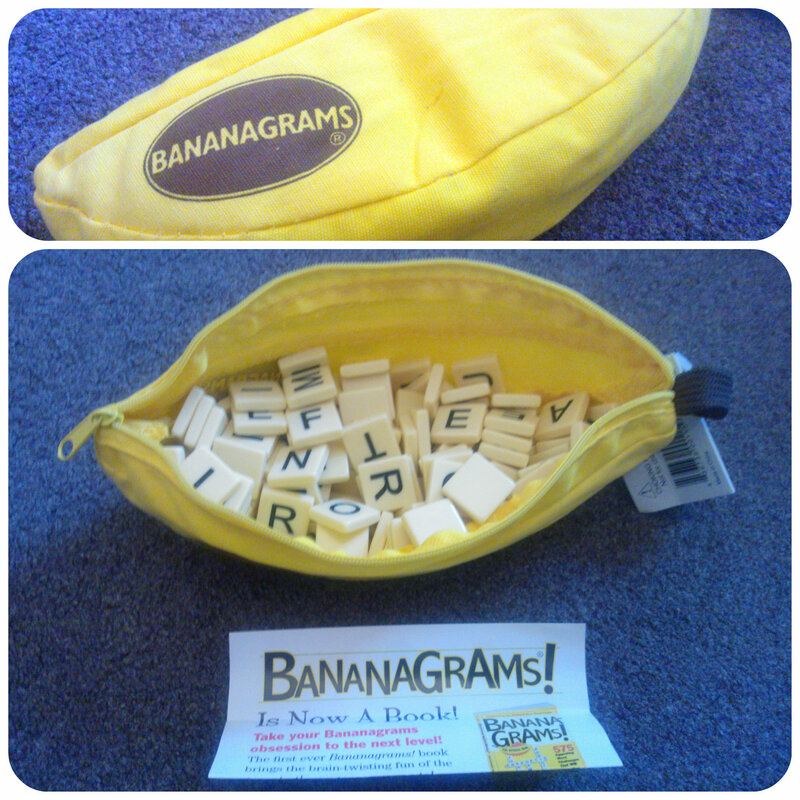 The game consists of 144 high quality letter tiles in a handy zip up banana shaped bag. The object of the game is to use up all your letters by constructing them in a crossword format and the first one to do so is declared the winner! I love the banana associated words used during play such as “split” to start the game, “peel” to pick up another letter, “dump” to change a letter and “bananas” when you have completed your crossword. Miss M is 6, but a confident reader and writer, and was particularly eager to play the game. We each picked our 21 letters and began to create words. I was really impressed at the words Miss M produced, some not valid, but i saw this as a great educational game for her to boost her learning, in particular spellings. I didn’t play a race game with her but just played with an aim to use up our letters. 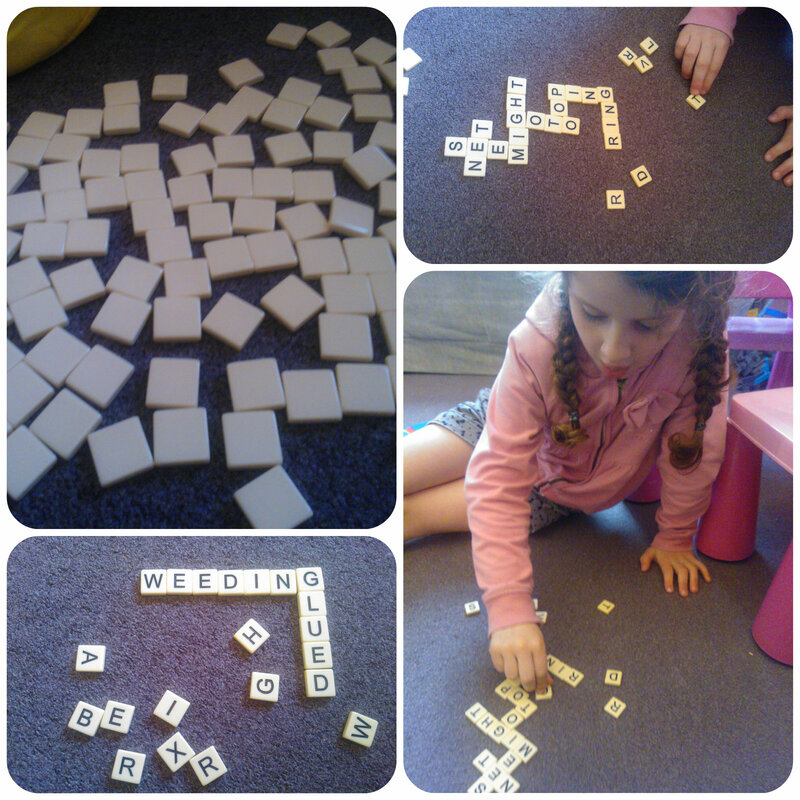 Bananagrams has really encouraged Miss M to think of words and how she can join them together. Also her spelling has been tested, although I was impressed with how well she did – her writing isn’t usually so well spelt! Bananagrams is a compact game when packed away which makes it great for travelling. I also love the fact that anyone can play the game and the rules can be adapted to suit the age range of the player or the situation. For Miss M we just played with the 21 tiles and tried to complete a crossword, but when the chidren were in bed, my husband and I enjoyed a full game of Bananagrams using all the letters from the banana bag! This is a fun game with durable pieces that I envisage having many years of play from. I think as the children get older they’ll use it to play against each other and we can have family fun playing together. 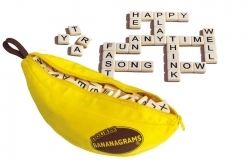 Bananagrams is a fun little game, simple yet one that you can happily play again and again. There are lots of other fun games in the range too such as Appletters, Fruitominoes as well as jumbo versions of each game which are all being tested out as part of the Rainbow Awards. Why not check them out?